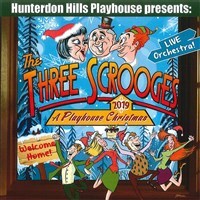 Join Perkiomen Tours as we travel to Hampton, NJ for lunch and "The Three Scrooges" Christmas show at Hunterdon Hills Playhouse. Celebrate Christmas with Hunterdon Hills as their 2019 holiday musical promises to deliver a heartwarming delight filled with a sackful of laughs and loaded with Christmas spirit! Featuring all-new original songs, classic and traditional favorites, uproarious family hijinks and spectacular dance numbers, all backed by a live on-stage orchestra. Lunch and Show "The Three Scrooges"
All Holly wants for Christmas is for her two estranged uncles and one estranged aunt, Curly, Larry, and Maureen, to come home for the holidays, cheer her ailing mom, and bury the hatchet! "The Three Scrooges" is a Christmas show unlike any other and a gift to treasure forever! We will depart for home after the show.